The company revealed its quarterly sales estimates two weeks after competitor IDC revealed that Apple had passed competitor Research in Motion to become the No. 4 global mobile phone company. Gartner's numbers also show Apple at No. 4 with a 3.2 percent market share, ahead of RIM but behind LG, Samsung and Nokia. Gartner also added that sales in Europe, Asia and Japan more than doubled from the third quarter of 2009, while iPhone sales put Apple in third place among vendors in Western Europe. "Apple delivered a stellar performance in the third quarter of 2010, selling 13.5 million units," the firm said. "It could have sold more but for its ongoing supply constraints and is now in fourth place worldwide." After strong initial demand for the iPhone led to limited supply, Apple has gradually improved shipping times for the iPhone 4. Apple's latest handset now ships within 24 hours when purchased direct from the company online. In terms of smartphone-only sales, Gartner found that Apple's iOS was the third most popular mobile platform in the third quarter, behind Symbian and Android. Apple's sales of 13.5 million units represented a 16.7 percent market share. Though Apple's total unit sales nearly doubled year over year, from 7 million in the third quarter of 2009, the explosive growth of Google's Android mobile operating system resulted in a lost market share for Apple. A year ago, iOS represented 17.1 percent of smartphones sold worldwide. 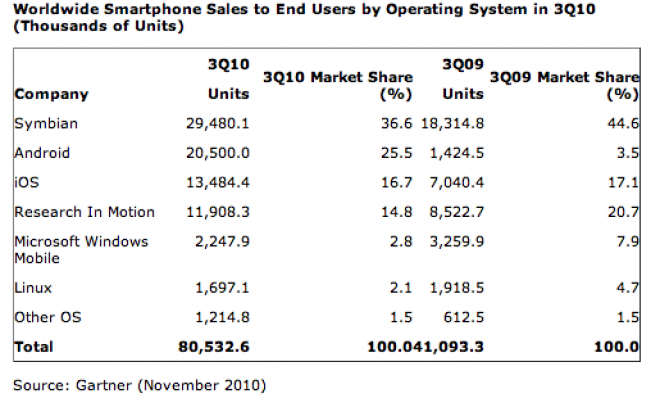 The total number of Android handsets sold in the third quarter of 2010 was 20.5 million, good for a 25.5 percent share. That was still less than the number of phones sold running Nokia's Symbian platform, which accounted for 27.4 million units and 36.6 percent of the global market. In North America, Apple surpassed RIM last quarter to become the No. 2 smartphone platform behind Android. "Apple's dramatic expansion of iOS with the iPad and the continuing success of the iPod Touch are important sales achievements in their own right," said Carolina Milanesi, research vice president at Gartner. "But more importantly they contribute to the strength of Apple's ecosystem and the iPhone in a way that smartphone-only manufacturers cannot compete with. "To a developer, the iPod Touch and iPhone (and to a lesser extent the iPad) are effectively the same device and a single market opportunity. While Android is increasingly available on media tablets and media players like the Galaxy Player, it lags far behind iOS's multi-device presence. Apple claims it is activating around 275,000 iOS devices per day on average ? that's a compelling market for any developer. And developers' applications in turn attract users.? The news that Apple had passed RIM was broken by Apple Chief Executive Steve Jobs during his company's quarterly conference call in October. Jobs asserted that it would be a "challenge" for RIM to "create a mobile software platform and convince developers to support a third platform." Gartner believes that media tablets, and largely Apple's iPad, will sell 54.8 million total units in 2011. Last week, the firm advised company CEOs to get involved and ensure the iPad is given IT approval for use at their company, or they risk being left behind in the competitive landscape. This is the third quarter. what about the fourth, or are they talking about calendar? If so, as I expect they are, I thought Apple announced they had sold 14.1 million phones, not 13.5. Analyst says Apple could have sold more phones if they'd had more to sell. And these people get paid for stating the obvious do they? Yet another example of execution errors. Isn't that Tim Cook's job? Everyone who wants an iPhone 4 will eventually get one, even if they have to wait a few weeks for their order, so the product lifecycle sales will always be the same unless supply problems become extremely bad. Although I love the iPhone 4, the competition is catching up and Apple need to listen to what it's customers want for the iPhone 5. 1. There are actually two volumes to control, the ringer and system volume but sometimes you need to run an app or itunes to adjust the system volume, otherwise you'd just adjust the ringer. [My alarm failed to ring a few weeks ago, not because of the Daylight savings bug, but because the system volume was at minimum. There needs to be an easy way of adjusting each voume. 2. Orientation lock - yes you can lock it in Portrait, but what when I want it locked in landscape? 3. Screen brightness - It would be good to have an easy way of adjusting screen brightness. My preference would be to have a + and - button on the other side of the device, maybe with a hardware orientation lock (mirroring the look on both sides). However, Apple doesn't like buttons so another solution is needed. 4. Easier way of switching Bluetooth on and off. Leaving it on drains the battery but if I'm going in and out of the car a lot, it can be a pain. 5. The antenna problems need a better fix than having a case on the device. 6. The camera still needs a little bit more work. I had hoped it would match that of the Nokia N95 8GB the phone replaced but I actually find it a bit soft, difficult to get correct colour & white balance as well as a weak flash (Xenon flash would be ideal). 7. Over the air upgrades needed - There are many users who would love just to have an iPhone and iPad without any desktop / laptop device. 8. Better multi-tasking - I don't see any reason why background apps cannot run, albeit with reduced clock cycles (processing power) assigned to then. Yes, there may be a hit on battery life but it would improve overall functionality. 9. Needs to support all carriers and network technology, including emerging 4G standards. 10. better durability. Although the glass is quite scratchproof, there are too many stories of either scratches or breakages of the glass. Apparently Apple just can't seem to do anything right according to you Mr. Obvious. They have $50b in the bank, outselling pretty-much everyone in the market, can't make their products fast-enough, have the highest customer-service satisfaction rating of anyone and yet by your accounts, they seem to suffer fumbles of management. What's taking so long for you to submit your resume to Steve Jobs? I'm sure he could use someone with your keen insight. According to the list that is pretty impressive in unit sales for BB OS, Symbian, and of course Android-based devices. I wonder if Android will best Symbian within the year or if they are plateauing. PS: sfocal, you?re falling victim to the Great Pit of FUD. Do you really want this Sarlacc to hijack and digest this thread for a 1000 years? I think Gartner counts "sold" vs "shipped". The missing 600k iPhones will turn up in the next quarter. Units, yes. Growth not so much. As a dev, I would like to know how many iPod Touches were sold, to get a real understanding of the software platforms. I would assume its at least a few million. Google is flooding the market. That's what, 40+ Android handsets? Apple just surpassed RIM with ONE (at most two) phones locked to a single carrier in the US - the US being the largest smartphone market. There currently exists no single "iPhone-Killer." Simply because the competition doesn't know how to make one. Most of these issues could be fixed with software. The antenna gap can be changed to location less likely to be touched. Still, I have not had a problem and I have tried to get calls drop by touching the gap, but it never happened. A smartphone needs some kind of case... too expensive and delicate. I like the bumper and it has worked well. The iPhone is not for everybody. I like its simple design and interface. Not too many buttons. Don't have to read a manual. For people who want to tweak, there is the Android, Windows. Got lot of buttons, bells and whistles... and most got to read the manual. Another advantage is the software... once I buy, I can use it in the iPhone, iPod, iTouch, etc. According to the chart, the market nearly doubled for smartphones in the period under study. Apple's sales nearly doubled too - they kept up with the market, losing a few tenths of a percent. But RIM's sales didn't double. Nor did Nokia's smartphone sales. They are fading. A couple of other things caught my attention, and I'm wondering if anybody might hazard some guesses? That "Other" category, holding steady at 1.5%. Is that WebOS? Hanging in there? Sad but feisty? And the significant number of new Linux powered phones: What phones are those? Who is buying them? Where? Not surprised at all. My wife's still on 2 weeks waiting list, hoping to get it before the end of the month. So is Apple doomed or not? It's hardly obvious. It is entirely possible for a company to make more product than they can sell, as it's certainly not a given that demand is going to outstrip supply. All the companies I mentioned had good YoY growth of unit sales. Only the free Android OS for the multitude of failing smartphone vendors had growth in their unit marketshare YoY. Even Apple dropped YoY in unit marketshare in their first full quarter for iPhone 4 sales despite still trouncing the entire market?s profits compared to any vendor. I think RiM still did record sales, too, despite their drop in unit marketshare, but that?s how markets usually work out, with the leading companies on top with the lackeys at the bottom struggling for profits with cheap devices.